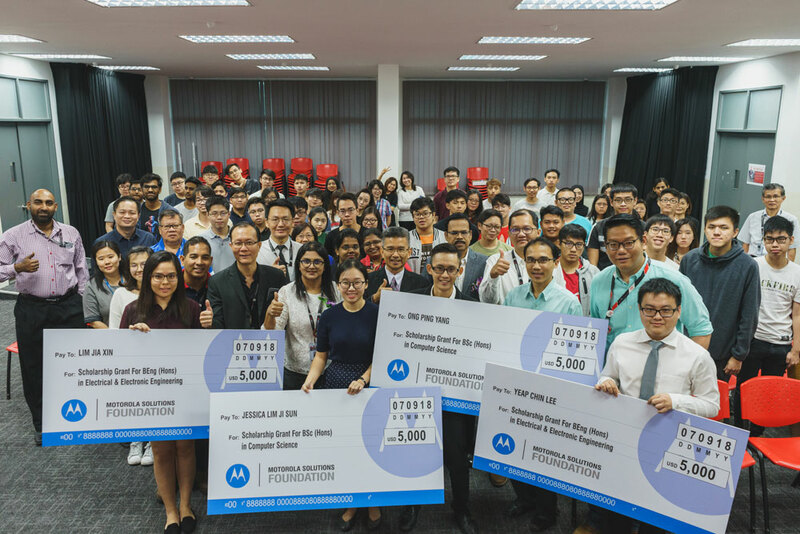 With its ongoing efforts in motivating and inspiring students to excel in science, technology, engineering and mathematics (STEM) education, INTI International College Penang (INTI) has once again been selected by Motorola Solutions Foundation, as one of the recipients of its international grant awarded in year 2018. Michael Loh (3rd from left), the Director of Engineering of Motorola Solutions Malaysia, hands over the mock cheques to Hemalatha Murugiah, Chief Executive of INTI Penang (3rd from right) and four undergraduates. With total worth of USD 45,000 been awarded this year, INTI continues to earn recognition from Motorola Solutions as an important incubator for STEM talents within the Penang State. 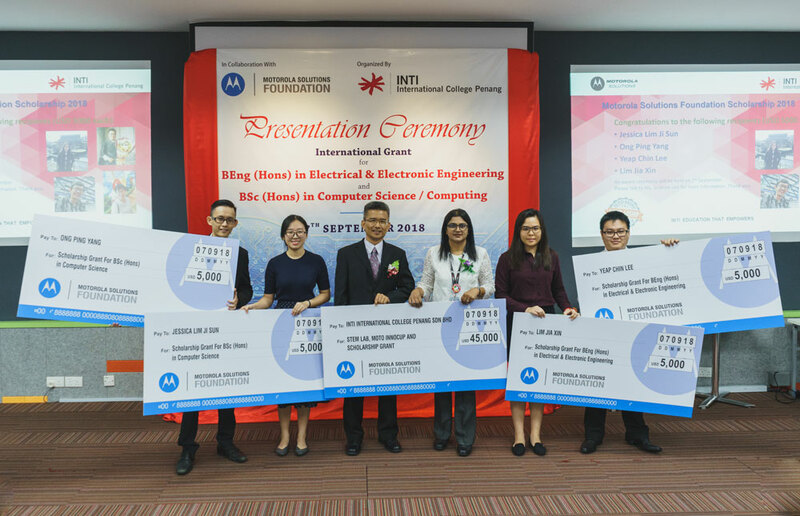 “INTI continues to be a key talent funnel for Motorola Solutions Malaysia specifically in the areas of electrical and electronics engineering and embedded systems,” said Michael Loh, Director of Engineering at Motorola Solutions Malaysia, during the grant presentation ceremony held at INTI’s Penang campus recently. “Our commitment to provide a platform to nurture the next generation, to cultivate creativity and innovation, as well as to build our future talent pipeline remains unchanged. We will continue to sponsor events and competitions such as the upcoming national-level competition, the Moto Innocup competition in November, which is in its 6th this year,” said Loh. the Moto Innocup competition. More importantly, the bulk of the sponsorship was provided as non-bonded scholarships valued at USD 5,000 each which were given to four deserving undergraduates. Motorola Solutions Foundation Scholarship recipients (from left) Lim Jia Xin, Jessica Lim, Ong Ping Yang and Yeap Chin Lee celebrating their joy with fellow students and academicians from INTI. These four scholarship grant recipients consisted of two Electrical and Electronic students and two Computer Science students. They are Jessica Lim and Ong Ping Yang who are enrolled in the 3+0 Bachelor of Science (Hons) in Computer Science, a programme offered in collaboration with Coventry University, United Kingdom; and Yeap Chin Lee and Lim Jia Xin who are studying Coventry University’s 3+0 Bachelor of Engineering (Hons) in Electrical and Electronic Engineering programme at INTI. Honorary guests from Motorola Solutions Malaysia who attended the ceremony included Clement Pakiam, Senior Engineering Manager of Common Mechanical Engineering and Elvis Simon, Motorola Solutions’ Engineering Manager. Besides that, students and academicians from the School of Engineering and Technology (SOEAT) led by the Dean, Johnny Wong Kee Hui; students and academicians from Centre of Excellence for Pre University Studies (CEPS) led by the Head of School, Dinash Kandasamy; as well as the heads of others Schools, Faculties and Centres at INTI, and members of INTI’s Electronic Club were also present at this ceremony. INTI’s partnership with more than 450 industry partners, including those from the engineering and technology industries in Penang, has led to outstanding graduate outcomes which were validated by BDO, including 99% of students being employed within six months of graduating; 83% being paid higher than the market average; and 43% receiving job offers even before they graduate.